Every year Sixth Class particiate in the Junior Entrepreneur Programme. This is a national programme that promotes entrepreneurship at primary school level. Every child proposes an idea and during the 12-16 week programme one is selected as the class business. Check out the Junior Entrepreneur website here for more details. 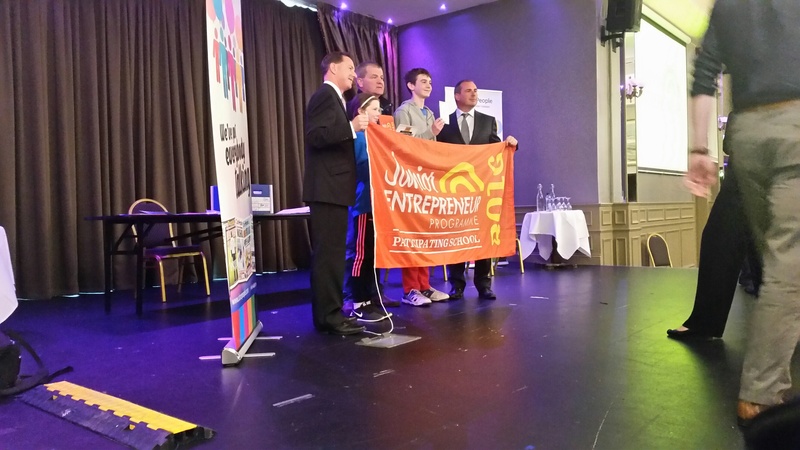 2016: Junior Entrepreneur Showcase: (JEP) On 17th of May 6th class went to the West County Hotel as they took part in the Junior Entrepreneur Programme. 6th met lots of people from different schools who also took part. For the Junior Entrepreneur project 6th class made all sorts of cards such as Birthday Cards, Holy Communion cards, Thank You cards etc. Dylan Collins and Lucy Scullion spoke on behalf of 6th class and explained the work we had put into our product. There were also successful business people there, who spoke about how they got started in business and how their companies became successful. We got free food which was good! 2015: In January, 6th class participated in the Junior Entrepreneur Programme. We divided ourselves into groups between 3-5 people and have been working on our different projects. Tom Liddy offered to come in and help Aileen, John and Mr.Curran to judge our projects. The winner’s project will get to be the main class project. This means the whole class will work on the same project. Thanks to Áine Gleeson (founder of Wowwee.ie), she has helped us improve all of our projects massively. Some of the projects included Amaze-Balls, Cakes, Phone cases, Phone Charger holders, Scones, Pancakes, Herbs in a Flower Pot, Canvases, Gardening service, Lip Gloss, Get a Grip for your socks. We all put so much effort into the projects. It took time and a lot of effort. We are very proud of what we achieved. Herbs in a flower pot has been chosen as the winner. We will go on to improve and develop this project together and hope to win the JEP as a class. By doing this class project we will improve on out maths skills and marketing skills.